I took this picture in my backyard last week. I actually grew this beauty with my own green thumb. I’ve had the plant for almost a year and I’ve been talking sweetly to it and fertilizing it and a mere 5 months after the last flower, this one raised its sleepy head for me! I LOVE Gerber daisies and especially hot pink ones. They stand out so brightly in my cobalt blue pots on the patio. This seems like a happy flower story but it is not. Thankfully I went out to photograph this flower in its glory because a sopping wet towel accidentally got flung onto it and snapped it’s little head right off. I looked out the patio window to see it in pieces about five feet from the pot lying with the wet towel. I blasted through the door and asked my sons what in the world happened! One pointed quickly at the other and then the accidental story was told. Without thinking, I asked quite loudly, “Do you have any idea how long I’ve waited for that flower to bloom?! ?” Of course he didn’t. He’s a boy. 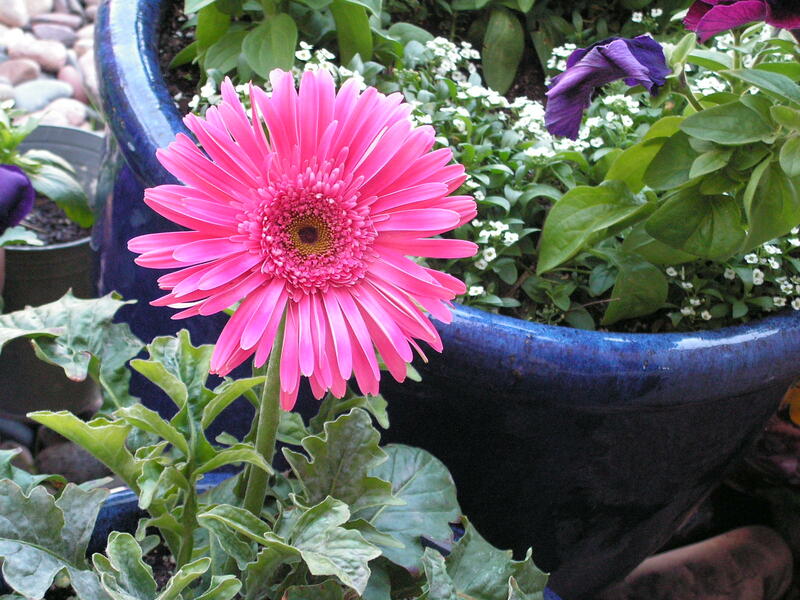 He probably didn’t even know I grew hot pink Gerber daisies in blue pots. He replied, “No.” ….. “FIVE MONTHS!” “I’m sorry, Mom.” And it was genuine and I forgave him and then picked up the little pink petals from the ground and threw them in the trash. The good news is there is another bud on the plant…. only possibly maybe probably 4 to 6 weeks till I have another hot pink beauty in the pot. They are worth the wait and until then, I have this great photo of the last one.